Members of the Fraternal White Knights of the Ku Klux Klan participate in the 11th annual Nathan Bedford Forrest Birthday March July 11, 2009, in Pulaski, Tenn.
America has a plethora of people and a bunch of haters. For the haters, there are hate groups, and hate groups thrive in this country. So the good people over at 24/7 Wall St. have come up with a list noting the "10 States With the Most Hate Groups." Using data from the Southern Poverty Law Center, which notes that there are some "784 active hate groups nationwide," 24/7 has recognized and determined that black people face the most hate, more than the number of those hated based on sexual orientation or other racial or religious affiliation. According to 24/7 Wall St., "White nationalist or white supremacist groups, including the Ku Klux Klan, neo-Nazis, racist skinheads, and neo-Confederates are by far the most common hate groups in the United States. And African Americans are by far the most victimized group of people by hate-group activity and other, less extreme forms of discrimination." The report also determined that separation has contributed to the level of hatred that blacks face. "Dislike, intolerance and hatred seem to diminish when people live alongside each other, and these attitudes are more likely to flourish when people are separated," the site notes. Unsurprisingly, most of the states in the top 10 are in the South, which has historically been more segregated than the rest of the nation. 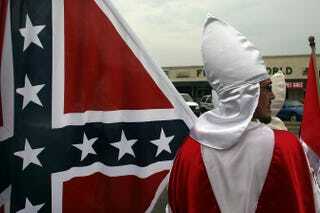 "The legacy of racial hatred in the South contributes to the high concentration of hate groups. There is a belief among many Americans in the South that 'the [Civil] [W]ar wasn't even over slavery, that the South has been pilloried, defeated militarily and treated terribly ever since,' " Mark Potok, senior fellow at the Southern Poverty Law Center, told the news site.